The Interactive Advertising Bureau this morning released its much-anticipated guidelines for so-called “native advertising” formats that mimic editorial content, including the online ad industry’s first-ever disclosure principles, which assert it is “paramount” that it should be clear and prominent to consumers that such ads were paid for. Defining exactly what they are, the IAB task force said, is another matter entirely. The playbook and guidelines make no reference to any industry plans to review or police said formats, which could raise issues as consumers, advocates and regulators react to some of the newer, more innovative and blurrier forms of native execution likely to evolve. The Federal Trade Commission is holding a workshop on the subject today. The new playbook, meanwhile, does a pretty good job of categorizing the current state of known native formats, clustering them into six general categories, including In-feed units, paid search units, recommendation widgets, promoted listings, IAB standard ads with “native” element units, and “custom,” the last of which could prove most vexing to nail down and monitor. The playbook provides some framework for thinking of each of these categories, including common language for describing what they are, as well as common disclosure language for making consumers aware of their nature, but it does not explicitly recommend what that language should be, or how it should be made clear and prominent. 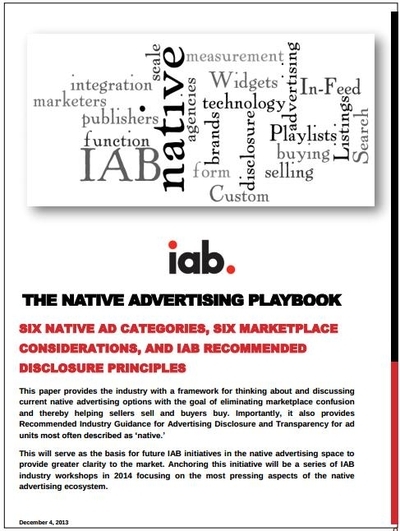 Here's exactly what the task force spells out regarding disclosure: “Regardless of native advertising unit type, the IAB advocates that, for paid native ad units, clarity and prominence of the disclosure is paramount. “The disclosure must: Use language that conveys that the advertising has been paid for, thus making it an advertising unit, even if that unit does not contain traditional promotional advertising messages. “Be large and visible enough for a consumer to notice it in the context of a given page and/or relative to the device that the ad is being viewed on. 6 comments about "IAB Discloses Native Disclosure Rules, Maintains Some Formats 'Can't Be Contained'". Mike Einstein from the Brothers Einstein, December 4, 2013 at 9:24 a.m. These guys clearly have too much time on their hands. Mike Einstein from the Brothers Einstein, December 4, 2013 at 10:12 a.m. I see a lot of grey area here. For example, what happens when a casino owned by Native Americans wants to place a native ad? Is there any dual-native ad disclosure rule that applies, or is this one of those formats that 'can't be contained'? Joe Mandese from MediaPost, December 4, 2013 at 10:58 a.m.
Mike Einstein from the Brothers Einstein, December 4, 2013 at 11:09 a.m.
Good one, Joe! Seems like only yesterday. Paula Lynn from Who Else Unlimited, December 4, 2013 at 6:51 p.m. Isn't there an algorithm for that ? Len Stein from Visibility Public Relations, December 5, 2013 at 10:49 a.m.
how about stamping each 'native' with "paid for by________" or "advertorial content read at your own risk"